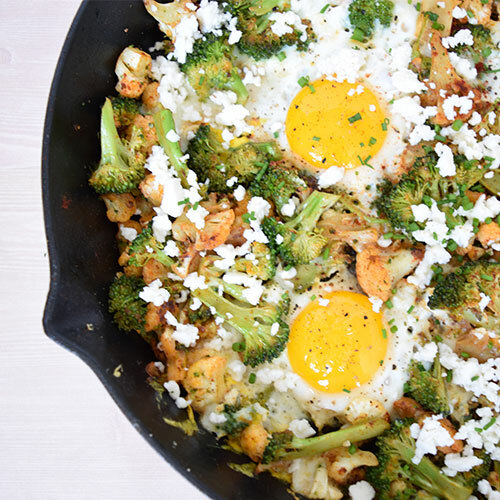 Heat large sauté pan or cast iron skillet on medium heat with 1 tbsp olive oil. When the pan is nice and hot, add cauliflower. Sauté about 3-5 minutes until the cauliflower begins to brown. Lower heat to medium-low, add broccoli and remaining 1/2 tbsp olive oil. You can add a drop of water to have a steaming effect which will help cook the veggies. Add spices (smoked paprika, garlic powder, onion powder, salt and pepper) and stir. Using a spoon, create 4 circles to make space for the eggs. Gently break in 4 eggs into the circles. Allow to cook until the egg whites are cooked with the yolk still intact. Add Real California Cheese Queso Fresco and season eggs with pinch of salt and pepper. Garnish with chopped chives and serve!